With a stay at Aizen Hotel in Nazare Paulista, you'll be in the mountains, and 11.8 mi (19 km) from Edmundo Zanoni Park and 11.9 mi (19.1 km) from Museum of Natural History. Featured amenities include dry cleaning/laundry services, multilingual staff, and microwave in a common area. Free self parking is available onsite. Located in Sao Paulo (Central Zone), Lugus Hotel is within a 15-minute walk of Sala Sao Paulo Concert Hall and Municipal Theater. Self parking (subject to charges) is available onsite. When you a stay at Pousada Hinano in Garopaba, you'll be by the ocean, within a 5-minute walk of Garopaba Lagoon and Ferrugem Beach. The front desk is staffed during limited hours. When you stay at Aí pousada in Buzios, you'll be by the ocean, within a 10-minute drive of Geriba Beach and Ferradura Beach. Free self parking is available onsite. 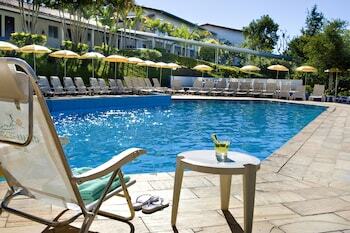 With a stay at Pousada Rural in Buzios, you'll be within a 15-minute drive of Geriba Beach and Manguinhos Beach. The front desk is staffed during limited hours. Free self parking is available onsite. With a stay at this apartment in Balneario Camboriu (Barra Sul), you'll be within a 10-minute drive of Almirante Tamandare Square and Estaleiro Beach. Free self parking is available onsite.